Once you have added a survey and are ready to revise the attributes or settings associated with it, you will need to access it in the Survey Editor for modification. There are two ways to access your survey. 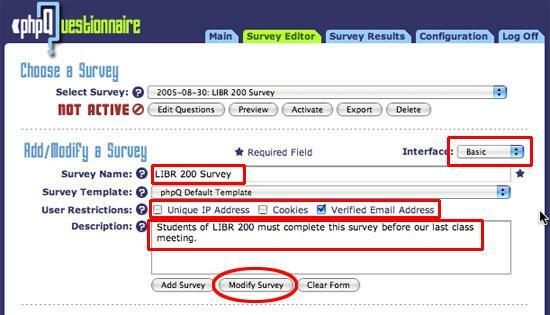 From there, your survey will appear in the Add/Modify a Survey portion of the Survey Editor interface. Note: phpQuestionnaire provides two interfaces: Basic and Advanced. The Basic interface (highlighted in red in the top-right portion of the image below) is strongly recommended; it gives you the quickest access to the most important details of survey creation. User Restrictions: These can be used to attempt to limit the number of submissions to one per user per survey. They are also effective in stopping accidental duplicate submissions and validating the user’s e-mail address. They aren’t, however, 100% effective and a determined user will still be able to make multiple survey submissions. You are allowed to select any of the following three options. Selecting none of them will allow any user to submit the survey as many times as they wish. You can select multiple restrictions to enforce multiple rules. You can use a user’s IP address as one method of blocking multiple survey submissions from the same computer. This is not a 100% guaranteed method and it can be fooled. In some cases, it may deny a legitimate user the ability to complete the survey if two different users are on the same IP address, and in other cases a user could simply change computers to submit the survey twice. In any case, it does provide protection against accidental duplicate submissions or someone who is not intent on submitting the survey more than once. Using these restriction, phpQ will attempt to place a cookie in the user’s browser each time they complete a survey. If phpQ detects they have already completed the survey, they will not be allowed to make another submission. Using this restrictions requires them to have a cookie-capable browser to complete the survey as it also checks to make sure they don’t have cookies turned off. This is not 100% protection and the program can still be fooled into taking multiple survey submissions from the same user. This is by far the most effective restriction. It requires that every person who completes the survey also supply an e-mail address which they are then forced to validate. It is still not 100% effective and cannot guard against users who have multiple e-mail addresses and wish to submit several surveys, but it does provide you with a working e-mail address with which you can contact survey respondents. ​For this example in survey creation, we shall implement the Verified Email restriction. Please do not change the default Survey Template (The option between Survey Name and User Restrictions). When you have finished modifying your selected fields, click the Modify Survey button to complete the modification process.